Yoga Hive a sports motivation system for senior ladies was designed my BSc graduation project in collaboration with the ProFit European project and the Innosport Lab Eindhoven. Yoga Hive invites elderly ladies to yoga through their hobby: handcrafts. It aims to create a joint social experience. The customisable DIY yoga kit made of soft knitted fabrics serves as the 'canvas for creativity' at the knitting circle. Once they are ready with customising the yoga shirt, they will be more drawn into showing and trying it at the yoga session. The yoga atmosphere is enriched by the ambient lighting reflecting their rhythm of breathing, helping them to reach mindfulness. The challenge was to motivate recently retired 65+ seniors to be physically active again. Exercising can become exactly what they need: a healthy physical activity and an enjoyable social gathering. The backbone of the project was user research with co-design methods: context mapping, creative sessions with seniors in elderly homes, LEGO playstorming with designers; concept evaluations with an elderly yoga group. 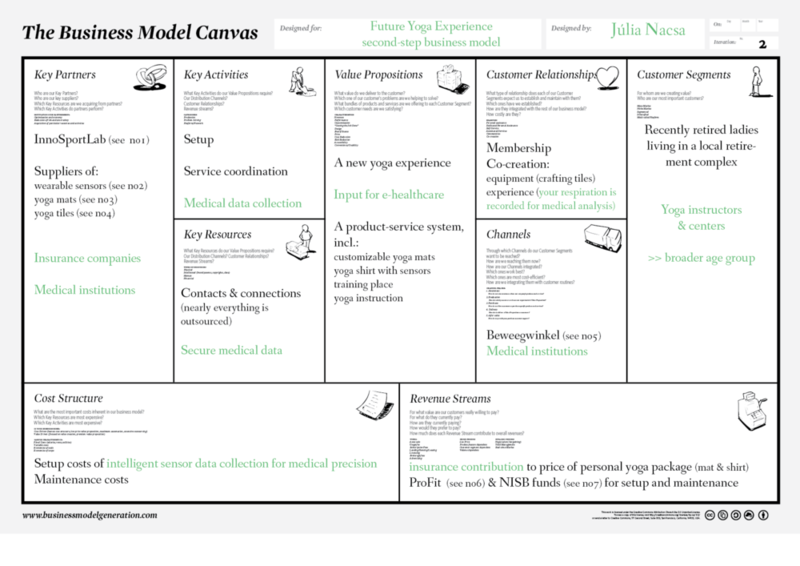 Yoga Hive was designed as a product-service system, I considered the connections of all possible stakeholders. The systemic level was captured with business model visualisations. Experience prototyping was used to validate the concept by evaluating it with users and experts. Custom-made wearable soft electronics measure the breathing rhythm, which is shown by the ambient floor lighting. The prototype was created based on an Arduino Lilypad and Processing.